If you lose many teeth, or maybe even all of your teeth, that has a drastic effect on your appearance, your comfort, and your ability to speak and eat. Your dentist can have a replacement made for those teeth. Most dentures are made of acrylic resin, and sometimes they also use metal. A partial denture can fill in the gap caused by missing teeth, and it can prevent the remaining teeth from shifting out of position, becoming loose, and then falling out later. 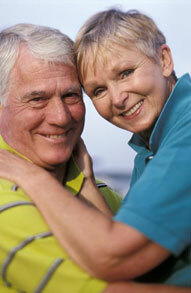 An overdenture is used if there are just a few remaining teeth or implants. It fits over the teeth or the implants. These remaining teeth have to be altered so they can support and stabilize the denture. Complete or full dentures can be made for the upper jaw, the lower jaw, or both if you have lost all of your teeth. If your dentist makes a complete denture for you, there are two more categories: immediate or conventional. An immediate denture can go in right after the dentist has pulled the last of your teeth. As your mouth heals and adjusts to the loss of your teeth, your gums and the supporting bone will both get smaller. At that point, the dentist can either adjust the immediate denture by rebasing or relining it, or fit you with a conventional denture if the tissues have healed. Your mouth will continue to change over time, but the dentist can adjust your denture so it fits again or, if that isn’t enough, just replace it completely.